Indian proudly celebrate “Republic’ Day, without much understanding of the deeper meaning of the word and the idea behind it. 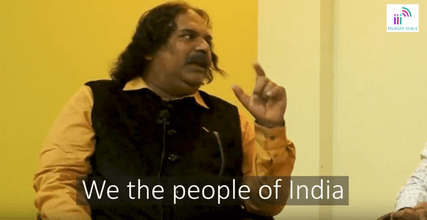 A conversation with Sambhaji Bagat to understand the interpretation of Republic through Subaltern perspective. Republic as defined is a state in which supreme power is held by the people and their elected representatives, and which has an elected or nominated president rather than a monarch. Is India, in current scenario a truly a Republic? remains to be questioned and understood with contemporary politics. The subaltern (Dalits) are the majority of people who have been left out of the power structure and the governance model along with Adivasi and the religious minority (Muslims & Sikh). The Jains and Parsi’s have been able to use their financial powers to tilt governance in their favour. The youth, specially the ones born at the turn of millennium, have not seen the days of war, emergency and riots after Babri, they were born in a globalized India,open market with access to everything at their finger tips. Few of the middle class (now voters) have experienced the queue of a ration shop. How to explain this youth the idea of India, through different dimensions that exist in this very nation. Sambhaji Bhagat, known as a folk singer (shaahir) is also a voracious reader, who has written plans and songs. His art is a reflection of his ideology and is pro people (subaltern). The above video is an attempt to understand this very dimension of nationalism which has been sidelined and never talked in mainstream. While the current regime is proud and on path to implement Hindu Nationalism ( Ram Rajya) the question we need to ask is “How can India be a Democratic Republic in Ram Rajya”. Is this very idea not against the constitution.? If so, is this act not anti national? As there are different streams of thoughts in this plural nation, we need to respect (need not agree) and live peacefully with each other, while worshiping the Constitution of India, in spirit and practice. While saying this we need not forget that the even the subaltern (Dalits) have their definition of Nationalism. In recent past, whenever Dalits have protested on streets, for atrocities committed on them, they have been branded as naxals and anti nationals. Dalit are now reclaiming their ‘cultural identity’ and this has been creating tremors in the governing class. As per the definition of Republic, as enshrined in the Constitution, Dalits too need to have their due space, which has been suppressed. All this subaltern ideology demands is effective implementation of the Constitution in its true spirit, seeks India to be a welfare state and justice delivered without discrimination.